Moon Palace Golf and Spa Resort near Cancun is located five miles south of the airport in Cancun's tranquil south shore. It is nestled between 123 acres of tropical foliage and a secluded white sand beach stretching nearly 2 000 feet. I have presidential suites, a villa or Jacuzzi suites. The two bedroom presidential suites all-inclusive price is as low as $4460 for seven nights (includes payment for four adults). This would include $3,000 in resort credits. My booking fee for the presidential suite is $799.00. Palace Resorts charges a $99 guest referral fee. The Jacuzzi suite all-inclusive price is $2,240. This would include $1,500 in resort credits. There is no booking fee for the Jacuzzi suites. Palace Resorts charges a $99 guest referral fee. Please inquire about our other accommodations. Two Bedroom Presidential Suite - Master Bedroom 1 King, 2 Double, 1 Pullout	 3 Master Bedroom and second guest room. Two Bedroom Presidential Suite - Master Bathroom full Toilet, Shower, Whirlpool/Hot tub	 Presidential suite has three bathrooms. Please inquire about our other properties, such at Beach Palace, Sun Palace (adults only), Playacar Palace, Cozumel Palace and Isla Mujeres Palace. I also have access to Le Blanc Spa Resort, owned by Palace Resorts. In addition, I have access to the Hard Rock Hotels in Mexico and Dominican Republic, also owned by Palace Resorts. Includes $3,000 in resort credits. The presidential suite all-inclusive rates are four four adults. Additional adult/ children pay an extra all=inclusive fee per person per night. Contact me about Jacuzzi suite rates. Included are free airport transfers, $3000 resort credits ($1500 for Jacuzzi suite), two free massages, manicures, pedicures and two free tours per guest. 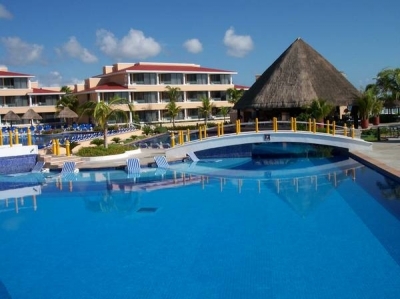 This is a large resort in a rural setting only ten minutes from the Cancun International Airport (CUN). It is divided into three sections: Sunrise, Nizuc and Grand. The resort is situated on a beautiful private beach.